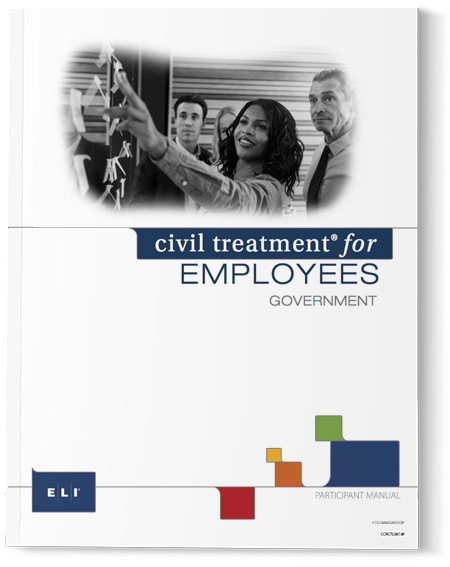 Civil Treatment® for Employees – Government provides individuals and teams with skills and insights required to enhance engagement, inclusion, productivity, and professionalism. 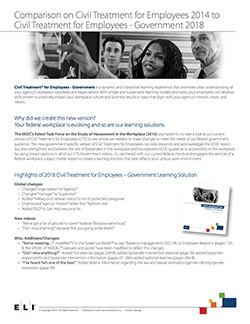 Civil Treatment® for Employees – Government is a dynamic and interactive learning experience that promotes clear understanding of your agency’s workplace standards and expectations. With simple and sustainable learning models and tools, your employees will develop skills proven to positively impact your workplace culture and business results in ways that align with your agency’s mission, vision, and values. By focusing on day-to-day behaviors along with the law, CTE is part of a comprehensive and sustainable learning solution designed to challenge and motivate your employees to consider the impact of their own behavior and encourage them to speak up when issues arise. 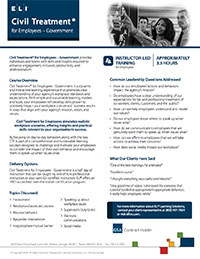 Civil Treatment for Employees simulates realistic workplace scenarios, offering insights and practical skills relevant to your organization’s success. Civil Treatment for Employees – Government is a half day of instruction that can be taught by one of ELI’s professional instructors or your own ELI-certified instructors. 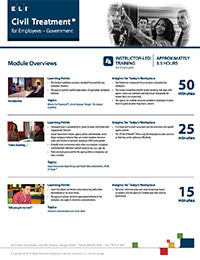 ELI® offers an HRCI accredited train-the-trainer certification program. How do our employees’ actions and behaviors impact the agency’s mission? Do employees have a clear understanding of our expectations for fair and professional treatment of co-workers, clients, customers, and the public? How can we help employees understand and model our values? Do our employees know where to speak up when issues arise? How do we communicate to employees that we genuinely want them to speak up when issues arise? How can we affirm to employees that we will take actions to address their concerns? How does social media impact our workplace?